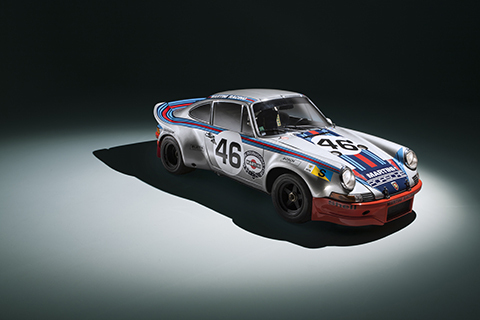 This Porsche 911 RSR finished fourth at Le Mans in 1973 – and returned four decades later. Octane hitched a ride with its original driver. Words: John Simister. Photography: Jamie Lipman (studio), Martyn Godda rd (Le Mans). Where have the gears gone? We’re powering out of Arnage corner at Le Mans, and the lanky Dutchman to my left is failing to find third. Neutral – blip – prod – blip – and we’re in, and once again this car’s particularly hard-edged interpretation of one of motoring’s most recognisable sounds lets rip. Car and driver have been here before. ‘Is it like 1973 all over again?’ I ask. ‘Yes it is, a bit,’ replies Gijs van Lennep, who came fourth at Le Mans in that year with the late Herbie Müller in this Porsche 911 Carrera 3.0 RSR. In fact the same driver pairing and car won at Le Mans in 1973 too – in a four-hour race at the end of the usual April test weekend, which Porsche entered at the last minute. The team lacked the cash for the entry fee, even after a mechanics’ whip-round, but the entry was accepted on the basis that Porsche would pay after the race out of any winnings. Seems the race organisers’ trust was repaid. We’re at the Le Mans Classic, and before the racing begins there’s the chance of a couple of speedy laps among a gaggle of other historic Le Mans racers. Some of the others aren’t really going very fast, so van Lennep squirts by them with an angry snarl from the RSR’s open intakes, unsullied by flow-inhibiting throttle shafts because these works cars ran as prototypes and could use throttle slides. There’s 340bhp on tap here, in a very light 911 with an instant response to the throttle. Wish I was driving it... but being driven by the man who knows, who has won Le Mans twice and who won the final Targa Florio in a near- identical car, is a better dream-come-true. Racing drivers are human, just like us, and sometimes even they can find a little extra speed when something stokes up the adrenalin. We’ve been stuck in a queue to get onto the track, with marshals seemingly not quite clocking what this car is, never mind who’s driving it. Maybe they think we’re a couple of chancers from the ranked battalions of 911s parked nearby in the car-clubs’ area, with our car painted up to look like a racer. No, guys, we’re the real thing, and van Lennep has a momentary lapse of cool. ‘Look, I won here. Twice!’ And suddenly the queue melts away and we’re on the pit straight, accelerating hard towards the hill, flicking through the esses, powering on to the Dunlop bridge and out towards Tertre Rouge and the public-roads part of the circuit. Meanwhile we’ve blazed down the Mulsanne straight, but 1973 speeds are off the agenda because of the two chicanes that weren’t there back then. ‘Otherwise the circuit is much the same,’ says van Lennep, who is now having a good crack at Indianapolis and beyond. ‘I came second in 1974, in the turbo version. Five or six hours before the end we lost all the gears apart from fourth. They said later that there was still a third, but I don’t believe it. ‘I drove the last three hours. On the straight I held it at 8000rpm with just a little bit of throttle, no pressure on the pistons. They were rattling, the bearings were rattling and I had to slip the clutch, but it stayed together. We did finally change our gearbox but Pescarolo came out in front. We could almost have won, but Pescarolo beat us in a Matra – with a Porsche gearbox!’ Pescarolo and Matra had won in 1973, too. We’re through the Porsche Curves, the RSR’s tail squatting and squirming as my chauffeur piles on the heat. Is there a special technique for getting the best out of a racing 911, what with the tail-heaviness and all? ‘In a modern car it goes a little understeer, neutral, understeer. So you go into the corner with no throttle, or brake into a corner, let it go, then throttle. The older the car, the quicker you have to go on the throttle, but you can only go fast if you lift off the throttle first. With this car, the more the throttle, the more the traction, but I’m not fighting it. 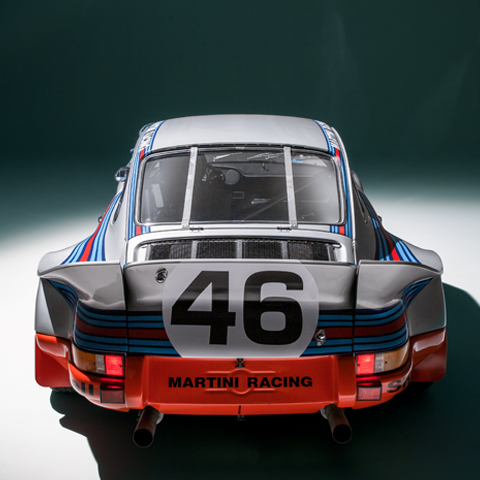 What, then, did it take to make the ‘prototype’ RSR out of a production 911? The 2.7 RS Carrera had already been developed as a homologation special on which Porsche planned to base its racing efforts in the post-917 era. 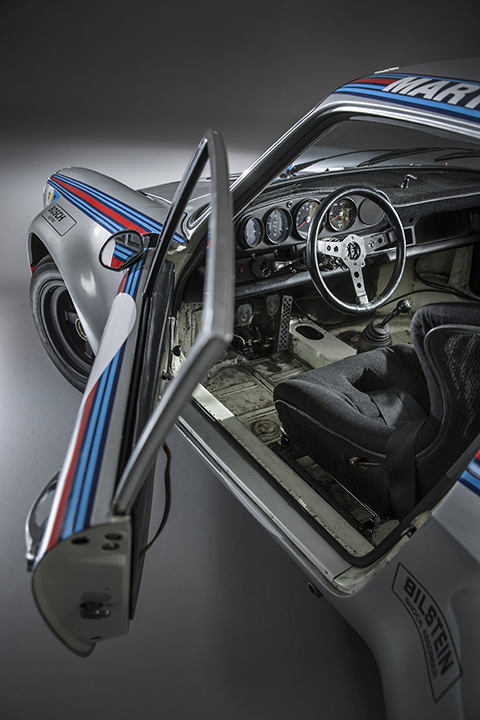 The RSR development of it featured a 2806cc engine and revised bumpers in lightweight fibreglass, with a front air intake for the oil cooler. The cars were raced in that form by the factory and by customers, and then gained new 3.0-litre engines (the 2994cc capacity later used in the road cars), which increased power from 300 to 315bhp. 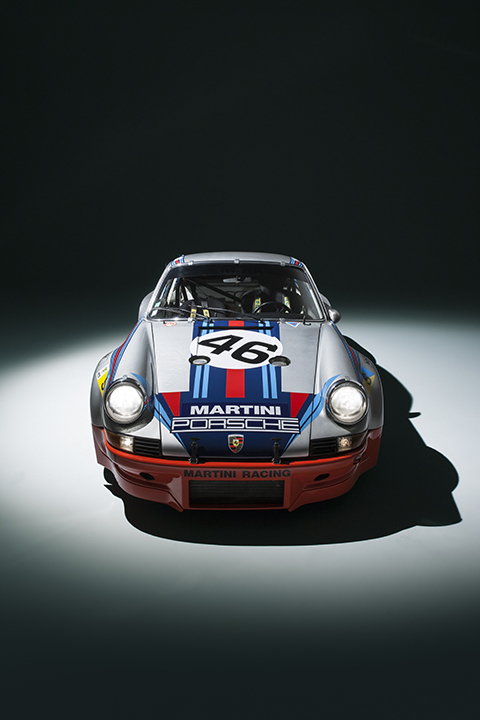 This car, VIN number 911 360 0686, was one of eight RS 2.7s delivered from the production line to the Porsche race department, and was assigned number R7 on its arrival there in February 1973. Among the many modifications made during the transformation into an RSR were new semi-trailing arms for the rear suspension, now shorter and stiffer. Arms with these dimensions later appeared in production 911s, but with rubber pivot bushes instead of the solid spherical joints used on this RSR and the Jürgen Barth/Georg Loos sister car that finished 10th at Le Mans in 1973. The inner pivot points were repositioned to increase camber change on suspension compression. At the front, the struts’ top mounts were given extra adjustability and the stub axle was positioned further up the hub carrier, to lower the ride height without compromising the lower wishbone’s operating arc. The standard torsion bars were augmented by variable-rate titanium helper springs mounted over the dampers. Other changes included adjustable anti-roll bars and a quicker steering rack, while the hubs and brakes were broadly 917-spec. So were the wheels, apart from narrower rims which still measured 11in across the rim at the front and 14in at the back. This called for the widest wheelarches seen on a 911 up to that point, and the body also gained a wider version of the original RS ducktail. 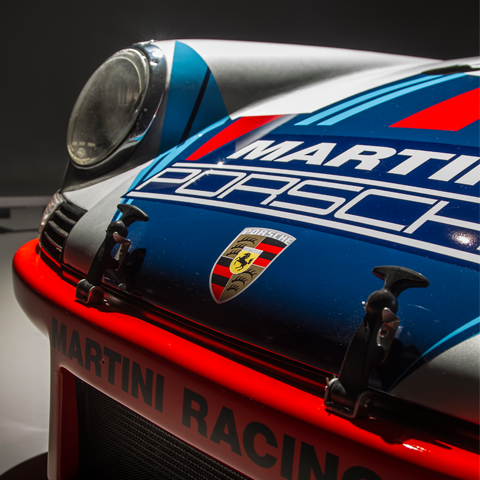 For the Targa Florio and onwards this spoiler grew, as on R7, into a continuation curving onto the wheelarches, giving the appearance of a collar resembling that popularly portrayed as worn by Mary, Queen of Scots. That’s how these RSRs became known as Mary Stuart cars. Twin fuel fillers poke through the bonnet, one to let fuel in, the other to let displaced air out. The bonnet itself and the rear arches are fibreglass, the front wings and doors are aluminium, the side windows are Plexiglass and the whole car weighs just 890kg. So when these works cars got an extra 15bhp, making 330, they went very well indeed. That power rise made up for the increased drag of the wider wheels, wheels which allowed higher cornering speeds than the customer cars could manage, helped by the extra downforce of the wide rear spoiler and the extended front air dam. Today, R7 is reckoned to produce 340bhp. It’s very well run-in now. That final power push came with the slide throttles at the bottom of potent-looking trumpets, giving an extra edge to an engine already running with twin-plug cylinder heads, enlarged valves and ports, camshafts with racy valve timing, Bosch mechanical fuel injection and a 10.3:1 compression ratio. Connecting rods were made from titanium, and a large oil cooler in the front air intake kept temperatures under control. The gearbox was broadly standard but with racing ratios, a limited-slip differential and a pump to circulate oil through a cooler. In all, then, R7 is not radically modified from a regular roadgoing 911 – that would come with later 934s and 935s – but is just a logical enhancement of what was there already. That, in part, is what made it so reliable and robust, as were most of its turbocharged successors. So, what happened to R7 after its five-race works career? After its final works race at the Zeltweg 1000km (seventh place) it was rebuilt with a longer, squarer-cut tail and sold to Peter Gregg in the US, who raced it at Watkin’s Glen. In February 1974 he sold it to Hector Rebaque, later a privateer Formula 1 driver in a Lotus 79, who raced it in Europe, Le Mans included, under Viceroy cigarettes colours and with various tail configurations. Rebaque later sold it to Massimo Baliva in France, who returned it to its original 1973 Le Mans trim. 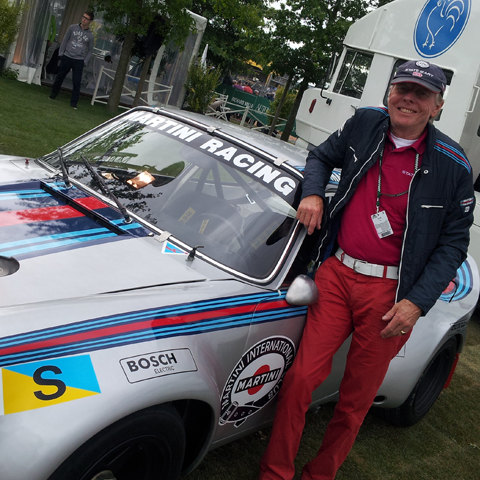 Now, at the Le Mans Classic, it’s owned by art dealer Kenny Schachter. ‘I’m going to put it in my office,’ he says. ‘If I drive it, I don’t see it. If I park it and leave it, I still don’t see it. So I’m going to live with it. It will be just across from my desk. ‘Porsches like this are radically undervalued. There are no 1970s Ferraris with a race history like this.’ Maybe it’s this desire to see it from the outside that fired Kenny’s generosity in allowing me to occupy the passenger seat in what looked like it might be R7’s last speedy outing for a while. Though, who knows, it may yet get used on the road – it has had a Monaco road registration – or perhaps someone will someday race it at the Le Mans Classic. I do hope so.